Mumbai : City-based Global Hospitals has received license to perform hand transplantation, a life changing surgical procedure to transplant one or both hands from a brain dead patient to the one who is in a need of a limb. The hospital opens door for potential recipients who are suitable to undergo the transplant. “We are glad to be fast emerging as the leading transplant centre in Mumbai and Western India. Today we are on the verge of a new era in upper limb transplantation with some of the most innovative procedures and protocols followed in our clinical care. We ensure that with our large team of specialists supported by world class infrastructure and technologies we are able to deliver exceptional patient care,” Global Hospitals CEO Manpreet Sohal said in a statement here. Global Hospital is widely experienced in management of transplant patients, immunosuppression and treatment of graft rejections. “We aim to deliver the best service to the society and the country, and maintain highest ethical standards, through our hand transplant centre,” Satbhai said. Last year ,Doctors at the Kochi-based Amrita Institute of Medical Sciences and Research Centre (AIMS) successfully conducted India’s first hand transplant. Since then PGIMER also made a move towards the milestone of hand transplants at the institute Across the world, around 110 cases of cadaver hand transplants have been registered so far, with less than 3% rejections. Hand transplantation is a surgical procedure to transplant a hand from one human to another. The “donor” hand usually comes from a brain-dead donor and is transplanted to a recipient who has lost one or both hands/arms. Most hand transplants to date have been performed on below elbow amputees, although above elbow transplants are gaining popularity. 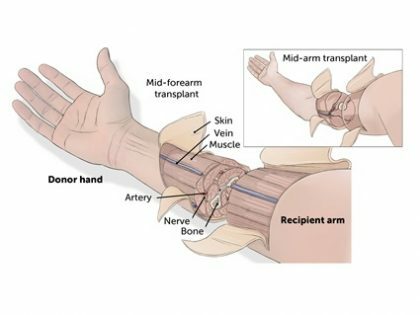 Hand transplants were the first of a new category of transplants where multiple organs are transplanted as a single functional unit, now termed “Vascularized Composite Allotransplantation” or VCA. Great idea. Hope it is very successful. My concern is the cost of not only the surgery itself but the post operative care and the ongoing immunosuppressive drugs. Does it mean that this treatment will be available or benefit to the few rich ones who are least likely to have amputation secondary to trauma ( which I believe is the commonest cause of upper limb amputation in the poor factory workers).